Pram, stroller, buggy or, if you’re feeling particularly fancy, ‘perambulator’ – whatever you want to call it, it’s an absolute essential, but while seemingly simple (put baby in, move baby from A to B, take baby back out again) finding the right one can be a minefield. So, we’ve rounded up the best prams out there right now to help you come to a decision on your little one’s new wheels. If we’re being really picky, ‘pram’ tends to refer to a subset of pushchairs that are ideal for newborns, parent-facing and allow for babies to lie flat – a moses basket on wheels, if you will – and many of our choices go along with that convention. To learn more about what types and features to look out for when buying a pushchair for babies of all ages, take a look at this handy guide from MadeforMums. It’ll probably come as no surprise to any pram shopper, however casual, that Bugaboo are currently reigning supreme as the crown princes of prammage, but offerings from Britax, Silver Cross and Mothercare’s own brand are also holding their own in our list of safe, comfortable and versatile prams, so you certainly needn’t be put off by a smaller brand name – simply read on and find your favourite. When it’s named after the most adaptive animal on earth, you know it’s got to be good. 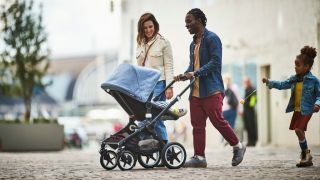 The Bugaboo Cameleon 3 has the cleverest wheels of any pram we’ve seen – not only are its tyres built to handle mud, grass, sand and higgledy-piggledy pavements, the bottom of the chassis can also be spun easily to put two wheels in front and one at the back, or vice versa. If your walks take in country, city, beach and everything in between, for its all-round winning combination of robustness and swiftness, there’s none better. The Cameleon3 might be a master of flexibility, but the Silver Cross pram and pushchair set comes a very close second, with a whopping 16 possible configurations for either one growing child, or two of different ages. It acts as a capable and comfortable single travel system (plus further carrycots, seats or car seats for other arrivals as needed) with the ability to be parent- or world- facing, an adjustable handle, fully extending hood, and comfort accessories like an apron, mosquito net and raincover, making for a versatile pushchair for one or more. MadeforMums described this latest Bugaboo release as a cross between the popular lightweight Bee model and our rugged first pick the Cameleon. As such, it’s a ‘best of both worlds’ kind of buggy, with large sturdy wheels for mounting pavements and muddy park trips, and a light frame that’s easy to carry and fold with a single hand. Where it has the slight edge on the Cameleon is in compactness, so if you make a lot of long car journeys and don’t have much space to spare, you might want to make this your go-to. Not a million miles from our second pick the Silver Cross Wave pram, this Mothercare set also features a pram that transforms into a pushchair for ultimate longevity, includes a travel system, and gives the option to add a second seat (sold separately) to become a tandem. It’s also about a third of the price, so while versatility might be priceless when it comes to making your life easier, there’s nothing to say it need cost a fortune. With a compact folding Z-shaped chassis and comfort accessories, too, it’s a worthy budget competitor. No matter where you live, the Silver Cross Surf 3 has been designed with you in mind – cool, eh? This pram-to-pushchair model’s adaptability makes it suitable for use in town and country alike, as it can switch at short notice between three and four-wheeled modes to suit different terrains, rather than leaving you to choose between a three- or four-wheeled buggy. It works out great in the long term, too. Attach the carrycot to the frame for a lie-flat pram, and separate for a suitable overnight sleeping environment for newborns, then switch up to the stroller seat when they’re ready. Goes, stops, turns and adjusts like… well, a pro! While not a pram in the strictest of senses – it’s our only model not suitable for use from birth onwards – it’s a great option for parents looking to trade up once baby is a little older. Tots from six months to three years can enjoy a smooth ride in this big-wheeled buggy thanks to its suspension system and swivelling front wheel, adept at navigating even tight twists and turns. With its sturdy build and smooth moves, not to mention comfort-boosting padded handlebar and drum hand brake for more stopping distance, it’s a great one for parents looking to power walk or jog with their little ones in tow. If including two Bugaboo prams in our top three wasn’t enough, you can also check out our guide to the five best Bugaboo strollers and pushchairs 2018 has to offer.